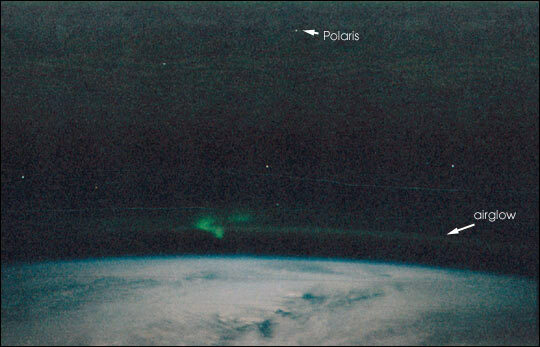 The other phenomenon in the photo (the green blob to the left of center) is the aurora. Green aurora occur from about 100 km to 250 km altitude only in the auroral zones at polar latitudes. They are also caused by the emission of 5577 Angstrom wavelength light from oxygen atoms that have been raised to a higher energy level (excited) by collisions with energetic electrons pouring down from the Earth's magnetosphere. The light is emitted when the atoms return to their original unexcited state. 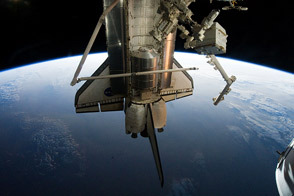 Image STS097-354-36 was provided by the Earth Science and Image Analysis Laboratory, Johnson Space Center. 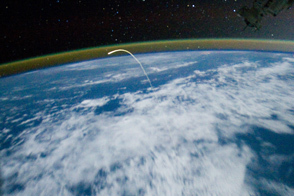 Additional images taken by astronauts can be viewed at NASA-JSC's Gateway to Astronaut Photography of Earth at http://eol.jsc.nasa.gov. Astronauts aboard the STS-97 Space Shuttle mission in December photographed the northern lights after undocking from the International Space Station. TThe faint, thin greenish band stretching across and above the horizon is airglow; radiation emitted by the atmosphere from a layer about 30 km thick and about 100 km altitude.